With new administrations come new agency directors, and it’s up to the governor to choose those people. Most of Republican Gov. Eric Greitens’ Cabinet positions have been approved by the Missouri Senate, while three still must be vetted. Steelman was a key Greitens supporter during his campaign, and along with her husband, David Steelman, was part of the transition team leading up to the inauguration. Steelman said she and her staff are “uniquely positioned to give input and guidance” to other executive branches. Chinn is from rural northeastern Missouri, where she and her husband raise “hogs, cattle, corn, soybeans, and hay,” according to a December news release. She has regularly traveled around the U.S. speaking “in defense” of family-owned farms. Chinn also said she wants to bridge Missouri’s urban-rural divide. Precythe is a native of North Carolina and was the first of Greitens’ Cabinet picks. She recently appeared before a Missouri House committee that’s investigating claims of harassment and retaliation against corrections employees by supervisors and co-workers, and pledged to overhaul the agency. Comer worked under ex-Indiana governor and current Vice President Mike Pence. Both Politico and the St. Louis Post-Dispatch report that Comer was a potential candidate to take over the federal Environmental Protection Agency under President Donald Trump. That agency is now being led by Oklahoma Attorney General Scott Pruitt. Juden oversaw both the police and fire departments in the southeastern Missouri city of Sikeston, and previously was division commander of the city’s police and fire departments. Juden has also served as a member of Missouri’s Homeland Security Council. There’s not much information about Walters. The news release announcing Walters’ appointment said he worked on U.S. tax practices and foreign business investment for PricewaterhouseCoopers’ New York office. Walters said in that release that he's looking forward to making sure Missouri has a tax system that will encourage businesses to move here. Lindley-Myers is Greitens’ first African-American Cabinet member. Greitens had named John Rehagen as acting DIFP director, but it appears he was a placeholder leading up to Lindley-Myer’s nomination. Rehagen had been director since early 2014 under Nixon. Williams was also surrounded by controversy in North Carolina over public testimony that he downplayed reports of coal ash contamination that polluted drinking water in wells located near power plants. He also ran for mayor of Raleigh in 2011, finishing a distant third. He is a licensed OB/GYN and practiced medicine in the Raleigh-Durham metro area. Dixon spent nearly five years with the Chamber of Commerce, including two years as the president/CEO. Before that, he was with the Hollister Chamber of Commerce for two years. Dixon also served in the Marine Corps for five years, including deployment in Afghanistan. Corsi earned a doctorate in clinical psychology from the University of Utah in 2006. He’s also an Air Force veteran and an officer in the Wyoming Army National Guard. "I share Gov. Greitens' passion for transforming the Department of Social Services to provide more safety and security to the most vulnerable in Missouri while also protecting taxpayer dollars,” Corsi said in a statement. Hui spent more than six years working as a policy analyst with the Heritage Foundation in Washington, D.C., which was founded by TV host and televangelist Pat Robertson. "I share Gov. Greitens' vision of reform to better serve workers, businesses, and taxpayers,” Hui said. “I thank him for this significant opportunity to lead the Department of Labor and look forward to working hard to promote the wellbeing of employees in Missouri." Missouri Department of Mental Health, overseen by the Mental Health Commission, which appoints a director. Mark Stringer has been in that role since July 2015. The commission has six members and one vacancy, while is expected to be filled by Greitens. Missouri Department of Conservation, overseen by the Missouri Conservation Commission. All four commissioners are appointed by the governor, though no more than two can be from the same political party. The term of board member James Blair IV, a Republican, expires July 1. Missouri Department of Elementary and Secondary Education, overseen by the State Board of Education. All eight board members are appointed by the governor, though no more than four can be from the same political party. Greitens could make an immediate impact on the State education board, as three board members are serving beyond their terms — Republicans Peter Herschend and Maynard Wallace and Democrat John Martin. The term of a fourth board member, Democrat Russell Still, expires this year. Missouri Department of Higher Education, overseen by the Coordinating Board for Higher Education. All nine board members are appointed by the governor, although no more than five can be from the same political party. The board has three vacancies, and three members serving beyond their terms — Republicans Dalton Wright and Mike Thomson, and Democrat Brian Fogle. Missouri Department of Transportation, overseen by the Missouri Highways and Transportation Commission. All six commissioners are appointed by the governor, though no more than three can be from the same political party. There is a vacant seat that Greitens is expected to fill this year. This story has been corrected to show that the Missouri Department of Mental Health's director position is not appointed by the governor, but by the Mental Health Commission. Missouri Gov. 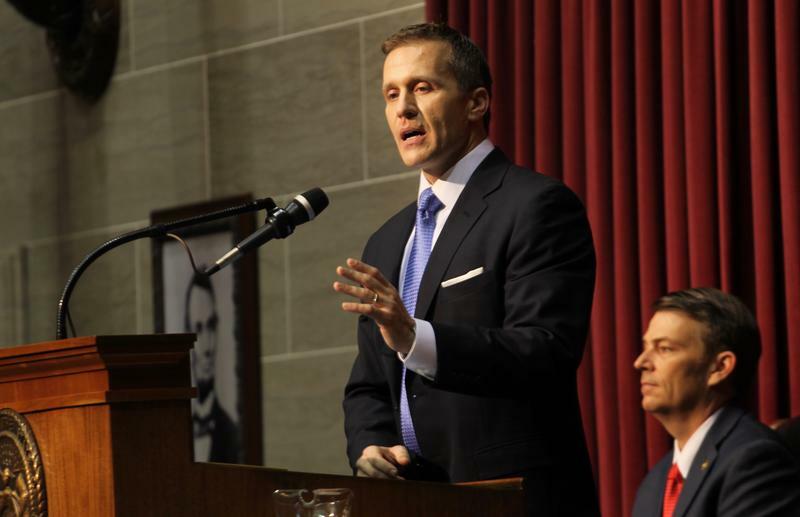 Eric Greitens has reversed about 60 interim appointments that ex-Gov. Jay Nixon made to numerous state boards and commissions. Officials say the about-face is pretty much business as usual and not terribly disruptive.